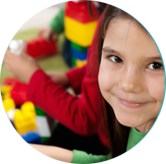 At Murphy Canyon Preschool we are committed to provide the highest quality child care available which enhances the social, emotional, physical and cognitive growth and development of children. We strongly believe that children learn better and faster if placed in a happy and positive environment and our number one goal is to create such environment. To us, the process of learning is just as important as are the results. Children need opportunities to play, learn and have fun. It is important that children not be limited to basic teaching methods. Through questions, minds are able to discover and grow. Our teachers constantly ask questions to stimulate and encourage responses from the children. It is only through open minds and an encouraging and fun atmosphere that children are able to grow. 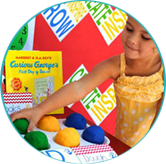 Murphy Canyon Preschool has designed a program that teaches children to associate fun with learning; a program through which children use their own ideas to inspire creativity and grow naturally. 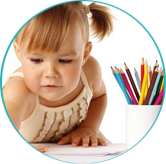 At Murphy Canyon Preschool we are committed to provide the highest quality child care available and possible which enhances social, emotional, physical and cognitive growth and development of children. We strongly believe that children learn better and faster if placed in a happy and postive environment and our number one goal is to create such environment. To us the process of learning is just as important as the results. Children need opportunities to play, learn and have fun. We have designed a program through which children use their own ideas to grow naturally. At Murphy Canyon Preschool the children will also have an opportunity to learn a second language at no extra cost of the parents. Children are able to learn a second language easily because they are still in early language development stage. Each day at Murphy Canyon Preshool we have designated time for certain age groups to work with a teacher for a minimum of 20 minutes.